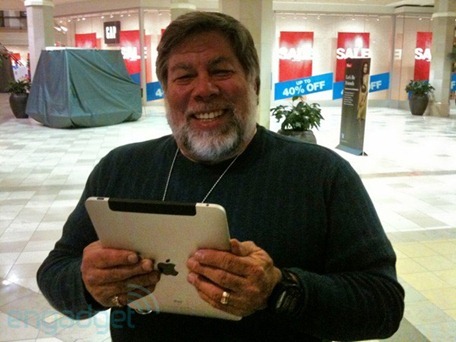 iPad 3G Spotted in the Wild with Steve Wozniak! We’re quite sure everyone knows by now that there are going to be two models of the iPad, one is the WiFi model and the other which sports 3G. The WiFi model was made available to public today, and the 3G model which will ship in late April was spotted this morning in one of the Apple Stores at San Jose Valley Fair. Looks like the 3G version of the iPad is ready and Apple is playing cool with it, maybe a marketing strategy to launch it late in April? only God knows why. Today, Steve Wozniak, the co-founder of Apple Computers was spotted with an iPad 3G at an Apple Store in San Jose Valley Fair Apple Store on the eve of iPad launch. Make sure you check out our iPhone Apps Gallery, and iPad Apps Gallery to explore apps and games for your iPhone, iPad and iPod touch. They're just waiting for FCC approval to finish before they can release it, and get a decent stockpile of them available. Nice to see they gave Woz one.